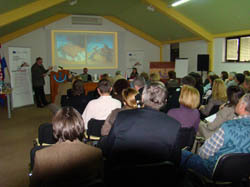 An expert conference on the topic of TRADITIONAL CRAFTS - A CHALLENGE FOR CULTURAL TOURISM was held on the 30th and 31st of January 2008 in Donja Stubica. More than eighty experts in the area of heritage, cultural tourism and traditional crafts participated at the conference. Along with the project leaders and partners, key topics were elaborated upon by the key note speakers present, while numerous participants from all parts of Croatia and Slovenia expressed their views on the topic in the second part of the conference. During the second day, a round table discussion was held concerning this topic, and conclusions on the conference were drawn. In the afternoon, an expert excursion was organized for the conference participants. Papers from the conference were printed in a joint publication in three languages: Slovenian, Croatian and English. The Centre for Traditional Crafts and Skills was formally opened in Kumrovec on the 17th of December 2007. The Centre was opened by Ms. Sonja Borovčak, the county prefect of the Krapina-Zagorje County. A basic database has been created at the Centre, as well as a support programme enabling the compounding of the data with the data previously collected for the purposes of the Museum. The data collected during the field research give an overview of the situation in the Krapina-Zagorje County area. The information had been obtained through focused questionnaires on traditional crafts, knowledge and skills, as well as on the bearers of the knowledge concerned, designed by experts in the field. The project includes the establishment of a collaboration with the tourist sector (including municipal, city, county, national and international tourist agencies, tour operators and other institutions involved in cultural tourism) and work on the creation of new programmes and the preservation of existing tourist destinations, including a collaboration with the connoisseurs of traditional crafts, knowledge and skills. 1 "Let us experience Hrvatsko zagorje"
2 " Gingerbread cookies and musical instruments fućke and žvegle as presents"
3 "Around the beautiful Stubica region"
5 "Let's have a drop for Marija Jurić Zagorka"
6 "Following the paths of old potters and leather makers"
The printing of the booklet “The Masters’ Book”, with the list of all bearers of traditional skills in the cross-border region. On the 28th of April 2008 in the Regional Museum of Ptuj in the Centre for Traditional Crafts and Skills in Slovenia, “The Masters’ Book” was presented, containing a listing of traditional craftsmen and skills bearers from both Croatia and Slovenia, along with the presentations of some of the traditional crafts, knowledge and skills. The exhibition of traditional souvenirs created by master craftsmen who participated in the project, shows how traditional products can nowadays find a new place on the market within the tourist offer. Besides for souvenirs, they can also be used when organising events and furnishing premises, so as to create a pleasant traditional surrounding. March 13th 2008 - before Jurjevski sajam (St. George's fair) in the Museum of Ormož in Ormož (Slovenia) an exhibition entitled "Following the paths of craftsmen along the Slovenian-Croatian border" was opened within the Craftattract project. April 8th 2008 the eponymous exhibition was opened in the old city of Beltinci, near Murska Sobota (Slovenia). April 23rd 2008, the exhibition "Following the paths of craftsmen along the Slovenian-Croatian border" was opened during the Traditional Crafts Fair in the Regional Museum of Ptuj in Ptuj (Slovenia). From June 13th to July 10th 2008 the exhibition "Traditional crafts products as souvenirs" was open for viewing in the Peasants' Revolt Museum in Gornja Stubica within the XI Triennial of Zagorje Souvenir, in the framework of the CRAFTATTRACT project. The exhibition will be opened on the 12th of July and will stay open until the end of the project – on August 31st 2008 - in the "Old Village" Museum in Kumrovec. The project includes a number of marketing activities aimed at directing public attention to the possibilities traditional crafts present for the development of a region. 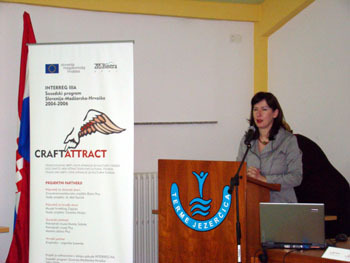 The CRAFTATTRACT project and its objectives were presented to experts engaged in the fields of traditional heritage, tourism as well as to the general public on the premises of the Croatian Chamber of Economy in Zagreb on the 28th of February 2008. In the framework of CROTOUR, a tourism fair which was held in Zagreb from the 7th to the 11th of May 2008, MHZ - the Centre for Traditional Crafts and Skills, Kumrovec presented the “Craftattract; Traditional crafts - new attractions for cultural tourism” project. Educational programmes have the objective of preserving the existing traditional crafts and skills and inspiring the interest of younger generations in traditional craftsmanship. A good professional cooperation had been established with educational institutions, especially in terms of organising workshops and vocational courses for elementary and secondary school pupils. In the framework of this project, a blacksmithing workshop was held, attended by the students of the Oroslavje Secondary School from Oroslavje. During the workshop, led under the professional guidance of the master presenter Ivan Žegrec from Bedekovčina, whose family has pursued the blacksmith's craft tradition for four generations already, students were introduced to blacksmith tools, blacksmith bellows, the lighting of the blacksmith fire and to the manner in which to forge. Within the workshop, students manufactured blacksmith nails of different sizes, as well as forged arrow points. They have expressed their impressions and desire for further cooperation with the master blacksmith in the following manner: "Our wish is for our school to continue collaborating with the master blacksmith in this way, in order to get acquainted with all the secrets of the blacksmith's trade." The period before Christmas presented an excellent occasion for the holding of a workshop entitled: The Making of Traditional Jewellery out of Crepe Paper, Straw and Textile. In the old days, paper, straw, cornhusks and textile used to be the basic materials for jewellery making in each Zagorje household before holidays – used for decorating homes, decorating the Christmas tree, or the sacred corner of the house. The knowledge and skill of making traditional jewellery in the region of Hrvatsko zagorje is still preserved today owing to the skilful hands of women who inherited this knowledge from the elder women, enabling them to today transmit it to the younger generations. This workshop was attended by the students of the Secondary School of Design, Graphics and Clothes from Zabok. The participants learned the basic techniques for making flowers and Christmas tree decorations out of crepe paper, as well as for making decorative hanging lamps out of natural materials such as straw and bast. During the joinery workshop, under the professional guidance of the master joiner Rudolf Žlender, the students of the Oroslavje Secondary School from Oroslavje were making usable objects out of wood, such as little stools, trays, chairs without a back, mastering the basics of the traditional way of joining of the processed wooden parts of objects, the so called cinkanje, i.e. slanted joinery, as well as joining at right angles. They also made a gadget, the so-called ‘servant’, used for taking off shoes, which was present in every Zagorje household in the past. The pottery workshop for the students of the Bedekovčina Secondary School – the specialization in ceramics, was led by the master potter Tomo Kovačić from Globočec near Marija Bistrica. The potter's craft has been passed on from generation to generation in his family, and so he has also, after mastering the skill of shaping bowls on a potter's wheel operated by foot, started making traditional forms of dishes for use, and is still shaping them today. He wants to pass his knowledge to the younger generations, and as the master - mentor his goal was to transmit the basic knowledge regarding the shaping of bowls: ranging from the centering of the clod of clay on the upper board of the potter's wheel, to decorating and baking the bowls in the baker's oven, and finally to glazing. The students of the Bedekovčina Secondary School, the carpenter specialization, wanted to learn as much as possible about this somewhat neglected and forgotten craft from the master Izidor Kuhar during his thatching workshop. The master taught them how to prepare rye straw for laying it over the roof of the object, how and in what way the processed straw - šop is put on roof beams, and how and with what these šopovi are fastened to the lath and brushwood. A seminar for traditional craftsmen and connoisseurs of traditional skills had been held within the project, in collaboration with the experts in cultural tourism. The Slovenian partners organised the seminar in which guidelines were set for further development of the project via several key points.